A Common Love For Each Other — Really? A good place for conversation. We need a new word! We’ve called them retreats, advances, weekends, and other things, but we need a good positive word that implies building a collection of common experiences with people that we go to church with, but that we don’t really know that well outside of church. I’m writing as the sun is coming up on Sunday morning over Lake Granbury. The sky is that pinkish orange in the east, the birds are awake, so the cicadas are toning it down, lest they become breakfast for the birds. The morning breeze is just enough so that I can sit here on the balcony in my pajamas and be comfortably cool on what may be one of the hottest days of this year by late afternoon. We’ll be home by then! Sherrylee and I have spent the weekend with three other couples and one single man, all members of our small group from church. Two couples we have known for several years; one couple joined our group just nine months ago, and the single man came into our lives even more recently. For two years now, we have been saying that the only way to really get to know people at church is to share common experiences outside of church—but that’s easier said than done. Finally, about four months ago, we committed to this weekend—and still two other couples could not make it work. Our goal was to be together, to get to know each other, to build each other up, and to build an album of common experiences that will grow more meaningful as we live and worship and serve together in the future. If you are younger, you might be surprised to learn that it is hard for older people to make new friends—real friends, not just new acquaintances. Sherrylee and I moved to Fort Worth eleven years ago. We left the place where our kids grew up and went to school, so we left their friends and the parents of their friends with whom we had shared so many school programs, soccer games, and musicals. We left our friends and colleagues at Oklahoma Christian, our friends at church, all of the people who knew us and our history for the previous two decades. We came to a new place, but one where I had grown up, so I knew people, and people have known me and my family from my youth. We came to a wonderful church—but most of the people had friends already, and almost everyone had family near. At our age, people are spending lots of time with either elderly parents, newly married children, or—best of all—grandkids! And many have all of the above to fill their lives! Sherrylee and I are doing the same—which doesn’t leave a lot of time and opportunity to build those more-than-superficial friendships that characterize most of our relationships at church. And yet we still not only long for deeper relationships, we need them for our own spiritual well-being. So our small group committed to this weekend away together, and it has been wonderful. Here are a few suggestions in case you might want to do something similar. Get out of town, but not so far away that it costs a lot to get there or you spend all your time traveling. We opted for Granbury—about an hour outside of Ft. Worth—over East Texas which is much prettier—for this reason alone. Watch your costs, but don’t make it so cheap or primitive that you are spending all your time trying to save money or be comfortable. We rented a house from VRBO.com for much less per person than we could have stayed at a resort or hotel. Staying at a house gives you a big living room where you can all sit around and talk,a kitchen and table where you can prepare meals and sit down together without worrying about restaurant disturbances—whenever you want to! And it gives you enough privacy for more intimate conversations if needed. Don’t overplan your schedule. Sherrylee made sure I didn’t overplan, which is probably my tendency. Having a pretty open schedule let us make plans as we go, creating more shared experiences. That doesn’t mean you shouldn’t line up a few options ahead of time, however. Don’t cut your time too short! We arrived about 3:30 on Friday and will leave by noon today (Sunday), all we could squeeze out of the weekend since most of us still have to go to work on Monday. A one-day Saturday outing might have worked, but having two evenings to sit around and especially a full morning on Saturday was perfect. Don’t leave God out of your fun together! We’ve talked about church, we’ve discussed our own spiritual issues, and we have prayed together. These things all happened pretty spontaneously in our group. In addition, however, we brought the Gospel of John DVD, a wonderful word-for-word visual rendition of the gospel, and watched it each evening before we went to bed. This morning after breakfast, we will watch Jesus celebrating His last Passover supper and finish the story as John tells it, after which we will break bread together and pass our own cup just as Jesus did. We will ask for God’s blessing on our community as Jesus did on His small group the night before He died. Don’t do it just once. Make the building of common experiences a tradition in your small group or with those you want to grow near. The sun is up now, so I have to go help with French toast. Don’t give up on having real friendships. 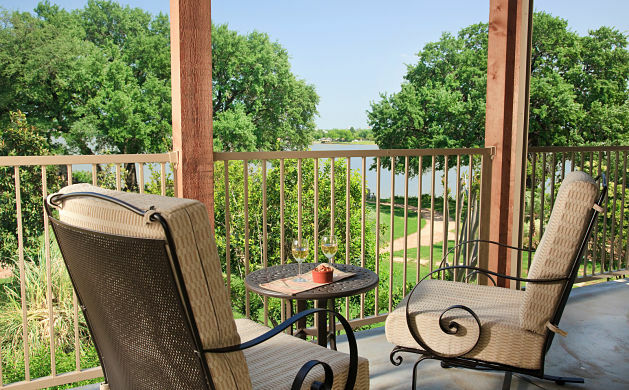 Maybe all you need is a trip to Granbury.